The larvae which are not usually attended by ants feed on a number of species in the Fabaceae such as Cajanus reticulatus, Indigofera pratensis and Millettia pinnata. Mature larvae 12 mm long, body pale brown with darker line: head brown. 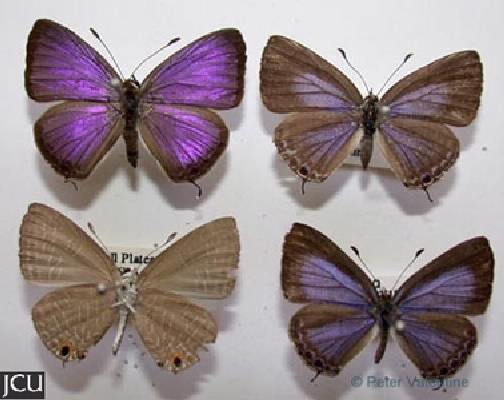 Adult male bright iridescent blue, outer margin black, hind with slender tail and some obscure spots; female dull bluish-purple, hind wing with obscure rings enclosing a black spot, slender tail present; lower surface pale brown with a series of spots and brownish bands outlined in white, rings near outer edge, two near the tail enclose black spots.